Horse and carriage traffic on Main in front of Elks Arch, ca. 1908. From the collections of the Texas/Dallas History and Archives Division, Dallas Public Library. 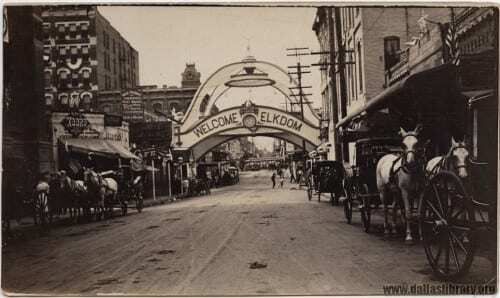 “Horse and carriage traffic on Main in front of Elks Arch, ca. 1908.” PA 97-7/145. From the collections of the Texas/Dallas History and Archives Division, Dallas Public Library.